The cruise ship Le Lyrial sailed for Cape Town at about 12.30 GMT on Monday 18th March with five Tristan passengers aboard. These were: Islanders Kelly Green and Conchita Repetto, Dr. Alex and Sally Wonner, and Aniket Sardana. The Tristan passengers boarded on Saturday 16th March when the vessel visited the island, so were on board for tours by Zodiac of Nightinagle and Inaccessible Islands. Le Lyrial arrived in Cape Town on Friday 22nd March. 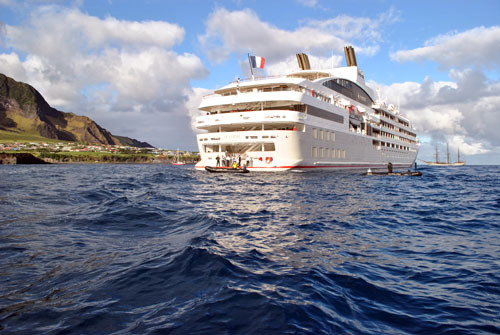 Sean Burns' 16th March photo shows the stern of Le Lyrial where passengers access the cruise ship. To the right of the cruise ship is the Bark Europa, and to the left the yacht Jonathon. Lovely weather made for a successful visit for all three vessels. It is very useful for the island if ships are occasioanlly able to carry passengers as the Ovenstone fishing vessels carry a maximum of 12 passengers and so often passages are delayed.